Before the Revolution, guns were in abundant supply in major Russian cities like Moscow and St. Petersburg. Packing heat in the country is no easy task. You need to pass a strict background check and only then can you own a hunting rifle or pneumatic gun. Things were different when the tsars ruled over the land though: Every man and his dog owned a weapon. The famous Russian poet Alexander Pushkin enjoyed a rather odd pastime: After waking up he would lie in bed and shoot a pistol at the wall. In Tsarist Russia, people loved guns. Officers, merchants, students, respectable dames, and young ladies all had a favorite handgun, sometimes more than one. However, by the end of the 1917 Revolution the authorities had restricted the right to carry firearms. Before the Revolution, guns were in abundant supply in major Russian cities like Moscow and St. Petersburg. 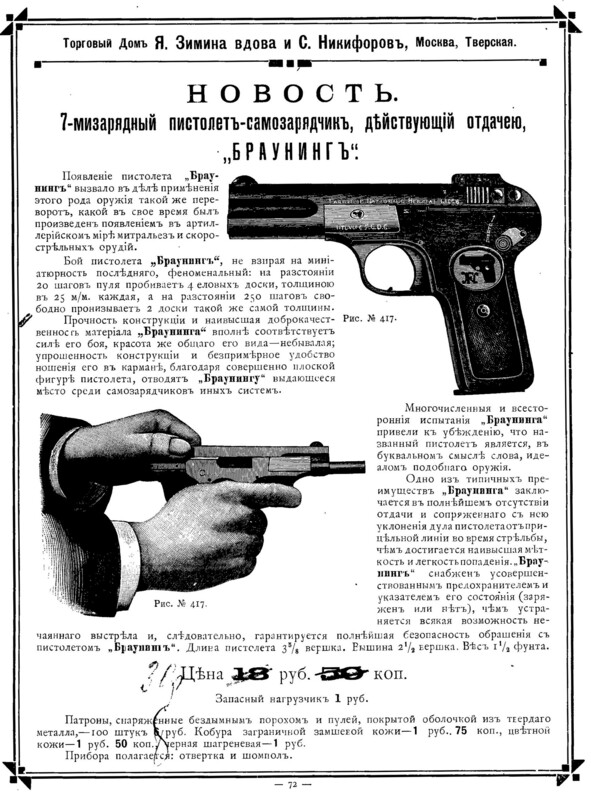 Newspapers advertised Brownings, Nagants, Mausers, and other models of handgun which were as popular as they were affordable: A brand new Mauser would set you back 45 or so rubles, so there were also plenty of cheaper secondhand guns floating around; to put this into perspective, a janitor’s average monthly salary in Moscow was 40 rubles. Newspapers advertised Brownings, Nagants, Mausers, and other models of handgun which were as popular as they were affordable. But even then Russians were not completely free of governmental intervention when it came to firing hot lead. The existing restrictions, however, did not regulate the ownership of guns; they regulated their use instead. Random and frequent indoor shootings were a serious worry in 17th century Moscow, where almost all buildings were made of wood - a spark from a gunshot could start a fire very easily. In fact, such blazes were so common that a 1684 tsarist order prohibited pulling the trigger indoors. Naturally, judging from Pushkin’s example everyone seemed to ignore the new rule until much later. A new wave of restrictions came in 1845, when a comprehensive set of gun laws restricted owners even further. The legislation prohibited shooting outdoors in crowded places unless clearly necessary. Although Russians were now stripped of their right to shoot for fun, nobody threatened to take their guns away - but this all changed with the Revolution. The Bolshevik Revolution put an end to the free circulation of guns among the general public. The leaders of the uprising knew only too well what the masses were capable of, especially if armed up to the teeth, and moved to monopolize gun ownership. In 1918 the Bolsheviks initiated a large scale confiscation of civilian firearms, outlawing their possession and threatening up to 10 years in prison for concealing a gun. The only exception was made for hunters who were allowed to possess smoothbore weapons. 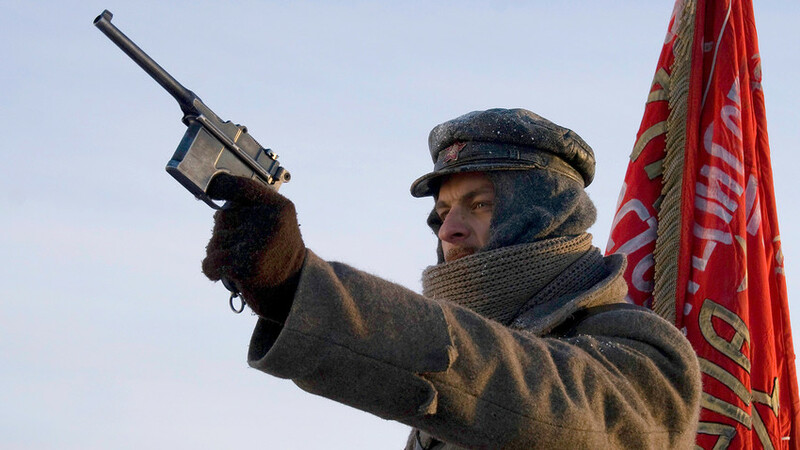 Gun licenses, however, were strictly regulated and only issued by the NKVD, the police organization known for its role in Joseph Stalin’s political purges. It was only a matter of time before Russia became an almost totally gun-free nation. Some people believed Russians would regain their right to own guns after the collapse of the Soviet Union but despite firearms becoming available on the black market during the 90s, the new government did not risk liberalizing the gun market. Today, Russians can only legally buy smoothbore guns for hunting and sports, as well as pneumatic firearms for self-defense. Applying for a gun license also involves a pretty rigorous background check. In a nutshell, Russians can buy some guns even today but luckily most have abandoned their ancestor’s favorite pastime of shooting indoors. How can a foreigner buy a Kalashnikov gun?